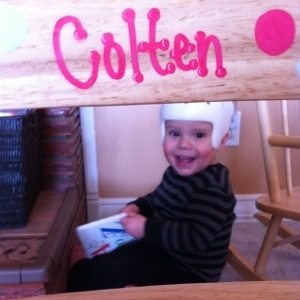 I want to say Colten took his first steps (YAY!!!!) but I feel like I need to put an asterisk next to it. And not because it’s Opening Day (Go TIGERS!) and that’s what they do when someone taints a record… I don’t feel he has tainted this accomplishment, but it is weird and I’m wondering, are these what I call his first steps?? *Sorry for lying, but these are actually Colten’s second steps. The first time I stood him up behind the wagon, I didn’t know what he was going to do – and when he did it, I was crying. So I did not have a video camera running but quickly grabbed it for attempt #2! We took him in at the beginning of March for a suspected hernia and yes, he has an inguinal hernia. It will get operated on in June when he has another urology-related surgery (part 2 of a procedure from November). Then a little further into March we saw Dr. Green, the Physical Medicine & Rehab doctor that is the overseer to all his therapies and equipment. We like her – she’s laid back, doesn’t push him into more “stuff” and seems very real about what to expect. We scheduled an appointment with her after Colten was evaluated by the Macomb Intermediate School District orthotist and team of therapists. They all pretty much cringed when Colten stood and twisted his ankles (without braces) and his knees (while wearing braces) and were very interested in seeing if twister cables would work for him. This seemed overkill to us for him and long story short, Dr. Green thinks he’s fine with what he’s doing. His knees have enough flexibility that doing this for the first 4-5 years of his life won’t be as detrimental as people think, and his ankles are pretty much not going to grow properly anyhow so it doesn’t matter. 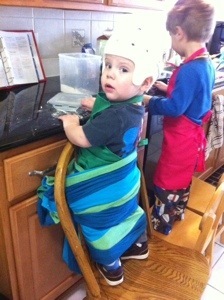 They’ll end up being braced mostly full-time when he’s upright all the time. The day after that, we had our first appointment with the boys’ new pediatrician. 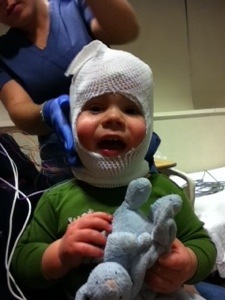 It went well…until she looked in his ears and found BOTH still had ear infections. It is either one really long, bad infection or he’s had three ear infections in 5 months! Thankfully our follow-up visit last week showed the infection cleared. There’s still fluid that leaves him susceptible and we have to make sure that goes away within three months or he’ll need to see an ENT, but the little man is finally back to himself after what has felt like months of uneasiness and crankiness. Whew. Then we lost our wonderful in-home nanny to the wonderful world of teaching. She had a great opportunity come her way and while we miss her, we do hope she is doing well in her new job! So the boys transitioned to a new sitter and are doing pretty good for the most part! Drop-off is not fun for our Max, but he bounces back as soon as I shut the door apparently. The next week we trekked back to Mott again to meet with Dr. Wan, Colten's urologist, as a follow-up to the pediatrician diagnosing his inguinal hernia. We were scheduled to follow-up with Dr. Wan in May prior to scheduling part 2 of a surgery he had in November. So this kind of took care of that for us and put us at ease for the hernia. Unless it changes, we do nothing. They'll repair that when they go in for the other stuff! June 23 is his next scheduled surgery. And LAST week (holy CRAP I am so glad March is over!) we were at U of M again for his sleep study. This is mostly precautionary but it is possible it could result in needing tonsils and/or adenoids removed. I'm not sure when we'll get the results of the study – I'm hoping within a couple weeks. Colten and I stayed overnight for this and it went pretty well considering. Considering he hated every moment of getting hooked up to the wires and stuff, and screamed quite loudly at the very patient techs applying all the stuff to him. He never pulled anything off or out and slept like his usual self. So we wait. 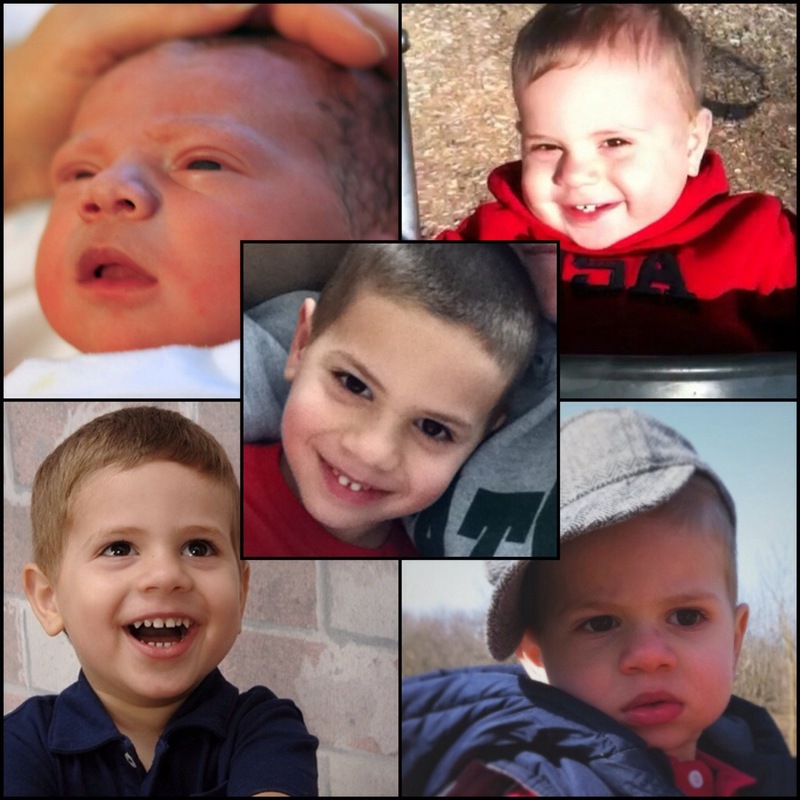 And now that Colten will be 18 months in a few days, we also get to transition therapy services within EarlyOn. (Were you factoring into your head, during my explanation of all those appointments, that Colten still had most of this therapy sessions going on too?!) Colten will transition to PT at a different district building and will now go two times each week (previously with EarlyOn, we went to PT every other week and OT came to our house the opposite weeks). He will get private PT at one of the visits and the other visit is more of a group setting. He's in a high-functioning playgroup with 2-3 other kids of similar age that all have physical disabilities but cognitively are on or close to appropriate targets. And we still have his Beaumont outpatient PT once a week. This increases his therapy appointments from an average of 2/week to 3/week. I'll see if I can make it work with our current schedule. This all changes in summer anyhow because the EarlyOn services in this district do not run over summer break. 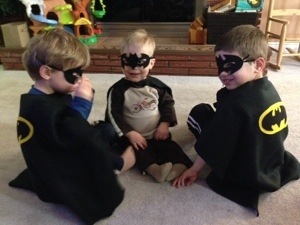 We went to Kindergarten enrollment and had an awesome Batman birthday party – he was allowed to invite 5 friends from his school (plus one of his other local buddies) – and our house was overrun by mini-Batmans. 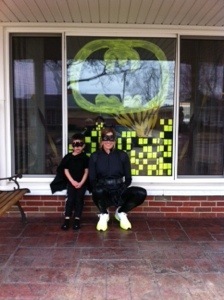 And Bat Girl! Richard had a successful closing to his Science Olympiad season – he coaches at the school he is employed at. The team took home a number of medals! He worked many after-school and weekend hours with these students to prepare them in a variety of science tasks and it seemed well worth it in the end. The girls were very proud of their accomplishments! Now, he starts in with a local track team and will help coach them for the rest of that season. I think someone once told him to say "no" to everything his first year of teaching. Evidently that went in one ear and out the other! He's burning the candle on both ends with all of this but seems to enjoy it deep down. I will say, we are LOVING the turn in weather and get outside as often as we can. 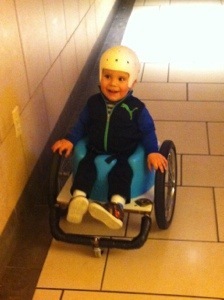 Colten's "wheels" are coming in handy out there allowing him to keep up with the other boys as they ride around too. I think his dynamic stander is arriving soon, giving him yet another option for mobility and exploration. Stay tuned and enjoy the weather! Hi Katie…………The Today Show had to take a back seat while I read this latest Adventure of Colten and when I came to the video of him WALKING while pushing that cart, I had chills as I said “Oh my GOD, Oh my God.” God really is guiding him along the way………..this is REMARKABLE. And then I read how you cried ……….. Oh, how I understand why. This little guy certainly is a gift. I too am happy that March has passed, and am so excited to see the results of sunshine melting the snow. I was even raking leaves off my mulch yesterday afternoon; have more to do when a big snowbank melts.